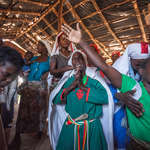 Zion Church of Mozambique took its name from the American town of Zion, located in the state of Illinois. 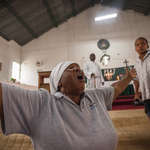 In 1904 Pastor Daniel Bryant, one of the Church’s founders, came from Zion to South Africa for preaching. 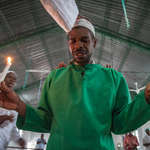 Firstly, the Church took root in South Africa and then spread to the neighbouring countries with the migrant workers returning home. 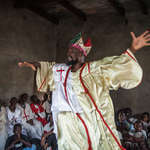 Nowadays in Mozambique there are dozens of different churches of Zion that don’t communicate with each other. 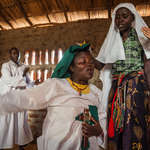 Their followers are called Maziones in local language. 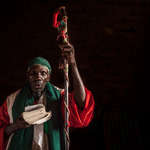 According to belief of Maziones, the evil spirits can possess anyone and should be excelled from the people. 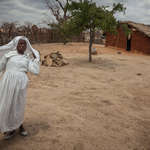 The Zion exorcism practices are usually conducted by prophets – special members of the community, who have the authority over demons. 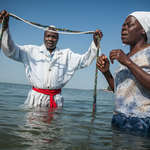 The ceremonies take place in the churches during the “nights of healing”, during Sunday liturgies or any day in the open water. 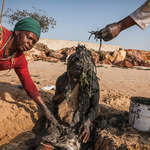 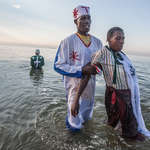 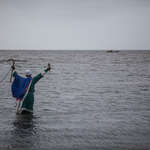 In the Mozambican capital Maputo on the five kilometres long “Beach of Maziones” those purification ceremonies are held two times a week – every Thursday and Sunday. 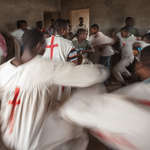 The exorcism practices are always accompanied by the ritual singing and shouting. 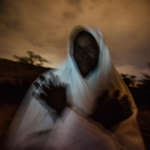 Most of the times possessed by “evil spirits” people become unpredictably aggressive and dangerous. 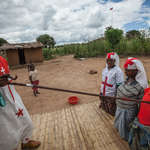 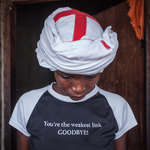 To protect other members from such violence, priests and prophets tie feet and arms of the possessed people with “tichakachakas” – special ropes that according to the Zion belief have God’s power to hold demons. 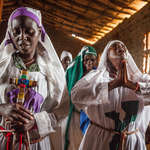 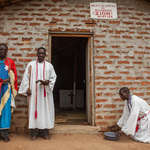 In the central Mozambican province of Tete near the Malawian border there is an entire village of Zion Church, called Tchessa. 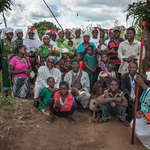 The villagers built a theocratic community that is governed by a 33 year-old prophet Sitifane Waisani. 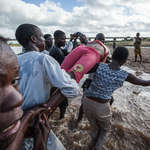 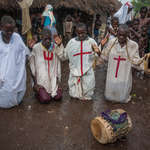 This place is very popular among Mozambicans and Malawians, who go there everyday to be released from the evil spirits. 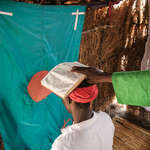 Many of Zion Church leaders also use an old proven traditional methods of healing. 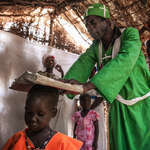 They frequently mix Christianity with African paganism and quite often Zion priests work as witchdoctors. 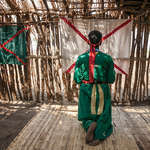 Exorcism ceremony in the village of Manje, Tete Province. 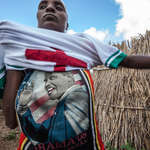 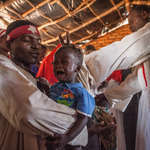 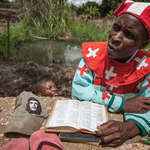 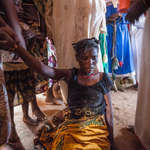 Prophet Sitifane Waisani, 33, performs exorcisms in Tchessa village, which is mostly inhabited by Zion Church members.